You go on the podcast, podcast goes on the internet, you go on the internet, shark's on the internet... our shark. Chris, Sarah, and Tim are closing the beaches to talk about Steven Spielberg's 1975 classic Jaws. Warning: Contains explicit language, spoilers, and uninformed speculation regarding the state of the Brodys' marriage. Listen to us on Stitcher here. Feel like we got something wrong (and that we don't have education enough to admit it?) Have a story about how Jaws kept you out of the water? Maybe you just enjoy talking about swimming with bowlegged women? Leave a comment below and keep the discussion going. 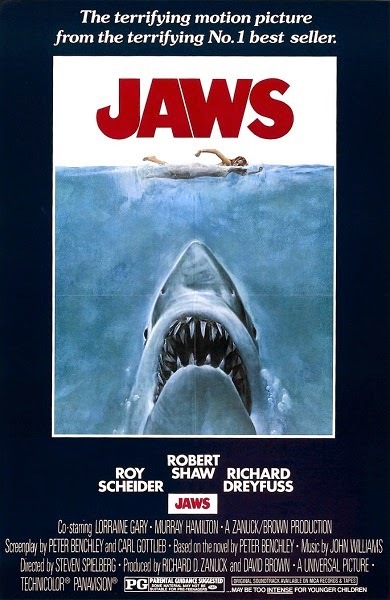 I had the pleasure of seeing Jaws on the big screen at the Brattle in Cambridge MA a few years back. It was phenomenal! Everyone(including myself) it seemed like were reciting the lines right along with the film. The print was pristine. Looked as though it was shot the day before. The scene at dusk were Brody is stumbling around on the back of the boat,, if you watch the sky closely, you can see a shooting star. Next to The Outlaw Josie Wales (future podcast maybe?) Jaws may be my favorjte movie. I really enjoyed listening to you guys! Thanks! I'm embarrassed to admit I've never caught up with Josey Wales. Definitely one to consider for the future and one I have to see at any rate. Strike that about the shooting star at dusk. It happens after the singing and the shark has rammed the ship a bit. Brody is taking out a gun and there's a shot of his head. In the sky behind him watch closely and you will see a shooting star. I knew there was something (probably many things) we forgot to bring up. I noticed two of them in that scene. I read somewhere they were real but considering they appear to have been shooting day for night, I kind of doubt it, but it's a fun game to find the shooting stars that pop up in many of Spielberg's other movies after that. The cynic In me has always thought that it might not be real. I fight it cause I so much want it to be real. Lol! Now I feel bad for bringing that up. Still, we know the shark isn't real and we've never let that bother us. Is there another movie that has been as thoroughly cut open and examined as Jaws (and were license plates from Louisiana found therein?)? Well, yeah, I’m sure there are movies far more scrutinized, but still... There’s just so much from this film that has worked its way into the everyday lexicon, from needing a bigger boat, to the opening two notes of the score. Even the tagline for the sequel (“Just when you thought it was safe to go back in the water...”) has become rather commonplace, if not lampooned. Seeing that you had chosen this film for a CinemaSpection review, I decided to watch it again before listening and caught some things that surprised me. First, though, let me just say that I originally saw the movie as a very young kid, and one living literally 5 houses from the beach on the South Shore. Suffice to say that it scared me (wonderfully) and it quickly became a tradition to watch it right as summer was about to begin, as a sort of self-discipline intended to make myself constantly aware of my dangerous marine surroundings. And like you, Tim, this is a magnetizing movie that always ends up pulling everyone in the house toward the tv set when it would come on. It’s simply brilliant, though to be honest, not until listening had I ever even considered it a ‘slasher’ type horror film, but I do indeed see how it could be taken in such a way. Now, back to the surprises that I caught this time (my first time seeing it in full in probably 10+ years): What I was most surprised about (though, really, I shouldn’t be) is how virtually every little line, every name dropped throughout the film, has a decent amount of web presence. Case(s) in point: During the scene where the townsfolk are gathered in the room to find out if the beaches would be closed, when the mayor says they indeed would be, but only for 24 hours, a woman can be heard whining about how “24 hours is like 3 weeks!” Sure enough, there’s someone who has commented that it’s one of their favorite lines. Similarly, during the 4th of July scene where nobody is yet swimming, a radio broadcast of a ballgame (presumably the Sox) can be heard, with “Jerry Christian” making a catch in left field. Someone has already researched this to find out that no such ballplayer exists, and that it’s likely a nod to a member of Spielberg’s sound editing crew from Duel. Amazing. Nothing escapes Jaws fans. One last thing is that after years of watching House, M.D., I never realized until this viewing that the name of the production company “Bad Hat Harry” was taken from a line of dialogue from this film. Thanks for another fun podcast, and do know how very envious of you I am for having been able to see it on the big screen. To be fair, the 'slasher' label was more one I had applied to it when I was just barely old enough to know what a slasher movie was and long before I had seen it and only knew of its reputation. Having grown up with it since then, I don't think it really applied now, despite sharing a few of that genre's conventions. It is definitely one of those movies that's been thoroughly absorbed into the public consciousness to an extent that's pretty rare. I once stumbled upon a website devoted solely to the mayor's hideous anchor-pattern suit and I can't begin to imagine how many bands have gotten their names from a stray bit of dialogue or an image from the movie. I hope you do get the chance to see it in a theater. It seems to get regular theatrical showings during the summertime.